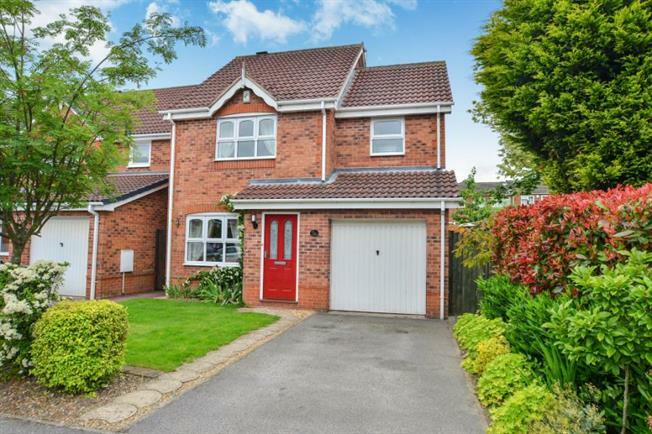 3 Bedroom Detached House For Sale in Nottingham for Offers in the region of £180,000. Well presented three bedroom detached house in popular cul-de-sac location. Accommodation briefly comprises of entrance hall, lounge and dining room all with under floor heating and engineered wood flooring. Also to ground floor is a modern fitted kitchen, spacious conservatory with heating and a downstairs WC. To the first floor are the three bedrooms and family bathroom, with the master bedroom benefitting from fitted wardrobes and en-suite shower room. Outside the property to front is garden area which mainly laid to lawn with driveway to the side leading to the garage with up and over door. To the rear is the enclosed beautifully landscaped garden with well established borders, lawn area and paved patio area. Hardwood front double glazed door. Radiator, engineered wood flooring and stairs to the first floor. Radiator, tiled flooring, part tiled walls. Low flush WC, pedestal sink. Double glazed uPVC window facing the front. Gas fire and underfloor heating, engineered wood flooring. Hardwood back double glazed door. Double glazed uPVC window facing the rear. Underfloor heating, tiled flooring, part tiled walls, spotlights. Wood work surface, wall and base units, stainless steel sink, integrated oven, gas hob, stainless steel extractor, integrated dishwasher, integrated tumble dryer space for a washing machine. Sliding double glazed door. Underfloor heating, engineered wood flooring. uPVC patio and French double glazed door. Double glazed uPVC window. Radiator, tiled flooring. Loft access . Built-in storage cupboard. Double glazed uPVC window facing the front. Heated towel rail, part tiled walls. Low flush WC, single enclosure shower, pedestal sink. With uPVC window to the rear and radiator. Double glazed uPVC window facing the rear. Heated towel rail, part tiled walls. Low flush WC, panelled bath with mixer tap, shower over bath, pedestal sink and vanity unit with mixer tap.